Hospitality and ? ? ? From Odysseus’ famous encounter with Polyphemos to Martial’s Xenia (book XIII), guests and hosts appear frequently in the ancient world. More recently, scholars have explored the role hospitality may play in less obvious ways, such as the potential for hospitality presented by itinerant sophists (Tell, 2011). The concept of hospitality deserves serious attention, in part because it offers an entry point—an invitation—to exploring other concepts such as reading practices, monastic orders, gift-giving, and citizenship. 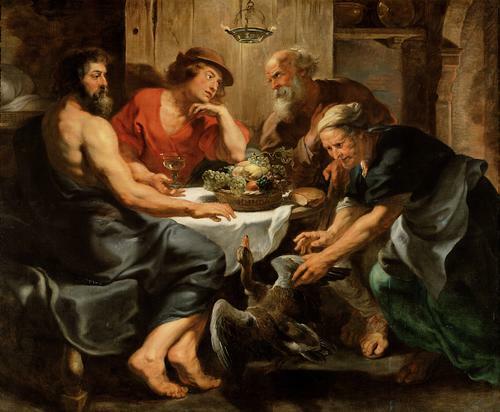 We invite you to add to the scholarly discussion of hospitality in the ancient world by relating it to other times, concepts, texts, and contexts. 10:15-10:45 "Blood for Speech: Aspects of Exchange in Odyssey 11"
11:30-12:00 "Piracy: Cause of Hospitality"
Seventh, Eighth, and Ninth Centuries"
of Equality in Early Byzantium"